I love the idea of edible decorations, but couldn’t come up with any tree or star shaped recipes that inspired me. Instead, I thought of one of my favorite dishes, the roasted eggplant that graces the cover of Yotam Ottolenghi’s beautiful cookbook, Plenty. (Incidentally, I am such a huge fan of Ottolenghi’s simple but divine vegetarian cooking that I would fly to London just to have lunch at one of his “delis”.) The pomegranate arils (seeds) that garnish these simple roasted eggplants look like little rubies and alongside the fresh herbs, well, it’s beginning to look a lot like Christmas. These eggplants graced my table as a side dish at Thanksgiving and will also be on the buffet at my holiday cocktail party this year. You can spoon it out delicately onto crackers, pita chips, triangles of sliced pita, or toasts, or just dig in with some pita chips. The original recipe calls for a buttermilk-based dressing; mine is topped with a garlicky tahini sauce, which makes this into a deconstructed baba ghanouj. 2. Wash and dry eggplants. Cut in half lengthwise and place, cut side up, onto a parchment paper-lined baking sheet. Use a paring knife to cut deep diagonal slices into the flesh, but not through the skin, of the eggplant halves. Repeat at a 45 degree angle in the other direction until you have diamonds. 3. Brush each eggplant half with a few tablespoons of olive oil. Sprinkle on a bit of salt and freshly ground black pepper. 4. Roast in oven for 45 minutes to an hour, until the flesh is soft when pierced with a fork, but the eggplant halves still maintain their shape. 5. Meanwhile, make the sauce by combining the tahini, garlic and lemon juice. Add salt to taste. 6. Arrange eggplants on a platter, spoon sauce onto each half, then top with pomegrante arils, parsley and ground sumac or za’atar. 7. Serve with triangles of pita, pita chips, or toasts. Thanks for coming by! If you enjoyed this, please leave a comment and/or share this with your friends. The front of that cookbook kills me every time I walk past that section in the bookstore! Yours look beautiful — and now that I have the recipe, I’m going to have to try it myself! Enjoy. All of the recipes are amazing. I’ve dined at one of the Ottolenghi outposts in London and I am serious, worth a trip! I can do anything with an eggplant 🙂 Thanks for coming by, Rashda, hope to see you lunching with us again soon! Happy holidays! I love Plenty and Jerusalem, and Ottolenghi is brilliant. 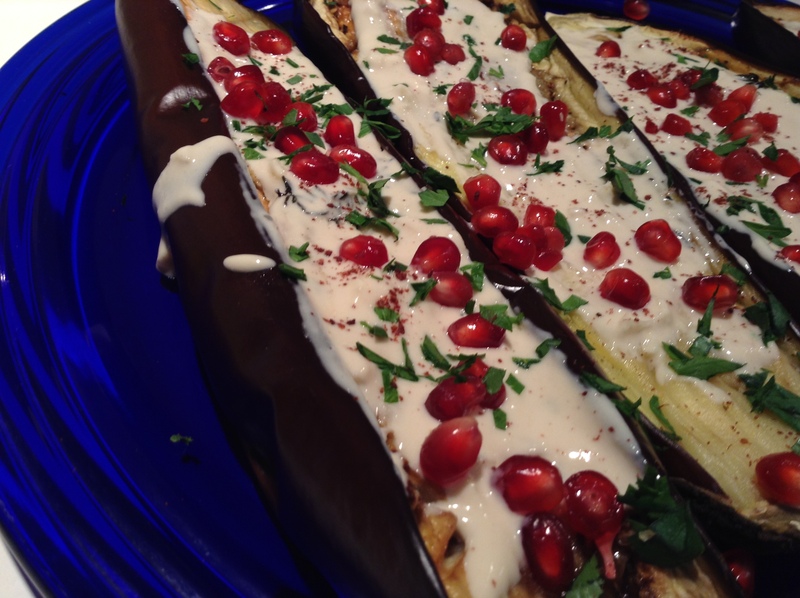 Love this recipe, eggplant is one of my favorites, and this looks so festive with the pomegranate, so beautiful. Hi Suzanne, thanks! Happy holidays! Pingback: Glass of Fancy » Blog Archive » Holiday Treats! Pecan Caramels - Fashion, fiction, and life in the city. I love eggplant and this is a perfect recipe for the holidays and beyond. It was fun to do #LetsLunch. 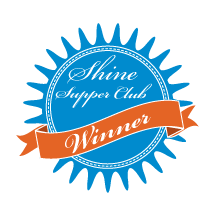 Thanks for sharing this and the blog-visit. Happy Holidays! Pingback: Edible Holiday Decorations: Ornament Sandwiches! | sandwich surprise! Wow, very xmassy, and it looks so snacky! And I love the snow falling on your site too! So beautiful — I thought only of sweet things, but you remind me of how gorgeous a savory dish can be. Inspired addition to holiday feasts and I will enjoy making it. substitute for pom seeds now that they’re out of season? That’s hard to sub. I’d just omit.